Then it was along the Prom where Graham pictured us from above from the Appley Tower. 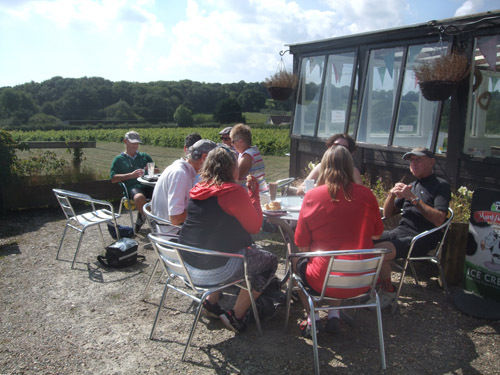 Then on via Seaview and up the first climb of the day along Puckpool Hill and roads just south of Ryde to turn off on an unmade road among vines for elevenses at Rosemary Vineyard at the Vineleaf Coffee shop. 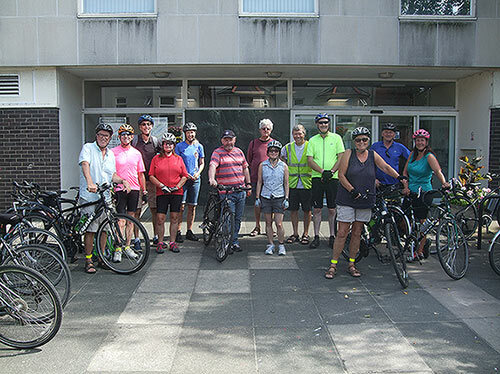 14 Riders met up for an easy paced ride at Bognor library on a warm afternoon perfect for cycling. There were leaders Carol & Steve Woods Colin, Bev, Chris, Mike, David&Lucy, Edwin, Julian, Sam, Harvey, Rosie, and David. Steve led the ride out over Highfield Road bridge under the under pass A29 past Tescos onto Rowan Way and along the cyclepath. Then left into North Bersted St into Chalcroft Lane into Hewarts Lane Then Rose Green Rd where Steve gave a demo of his walkie talkie contact with back marker Carol after changing channels because a yachtsman was butting on asking where we were going. Then left into Hook Lane for a picture stop. 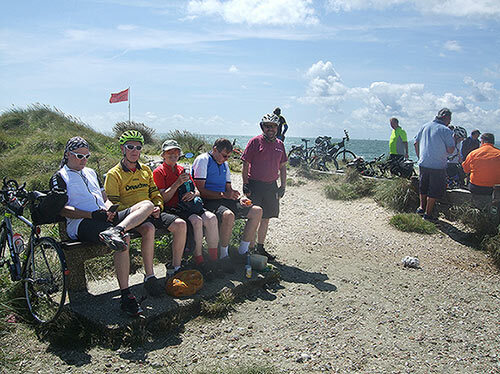 Then left into Pagham Rd left into Sea Lane where we reached our destination, we were met at beach cafe by George & Michelle Sinclair which made 16 for return journey after tea, cakes, Cheesy Chips and on Sam's insistence large ice creams with flakes which was served to us by the very friendly staff at Beach Cafe. Thank you to all the lovely people who joined the ride today. It was a beautiful sunny evening for the last Evening Ride of the summer. 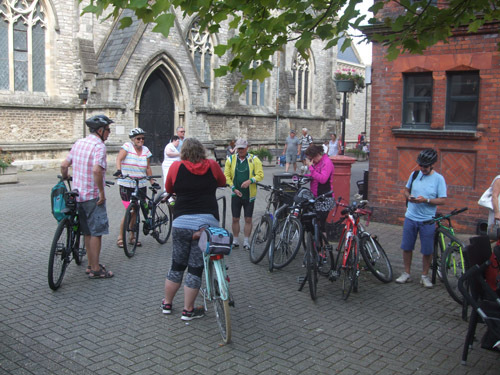 4 met at Chichester Cross and 7 led by David met at Felpham Leisure Centre with both rides heading to The Gribble, Oving to meet up. David set off at a brisk pace with his park run fitness clearly showing. We headed initially to the path by the Golf Club only to find that blocked off as they are finally doing work to turn it into a proper cycle route. We diverted on back streets and a short stretch of the new road before turning off on a footpath to link with the Barnham Path. With it being close to sunset most of us stopped to turn on lights at the end of the path by the Church. Then it was on up Church Lane and through Barnham to Eastergate and across to the Oving Road. We turned off on the quiet Woodhorn Lane to take us round to The Gribble, Oving. The Chichester Group were already there led by Graeme Hodge. 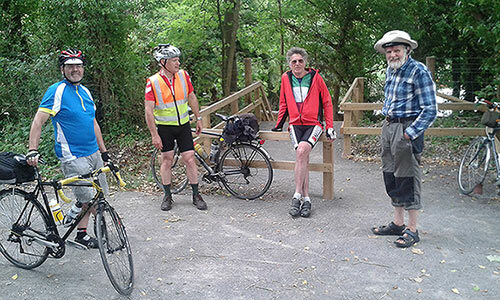 They had taken a route via Westerton, Halnaker, the cycle bridge over the A27 and on via Tangmere to Oving. 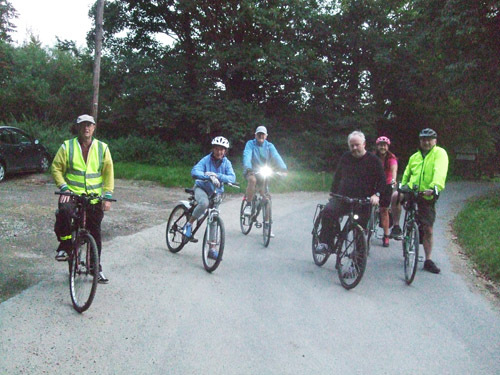 Our return was on dark unlit lanes save for our bright cycle lights via Colworth to Bersted. It was a beautiful sunny morning today with temperatures reaching 19C. Though cloud moved in for the afternoon the rain held off until the evening. 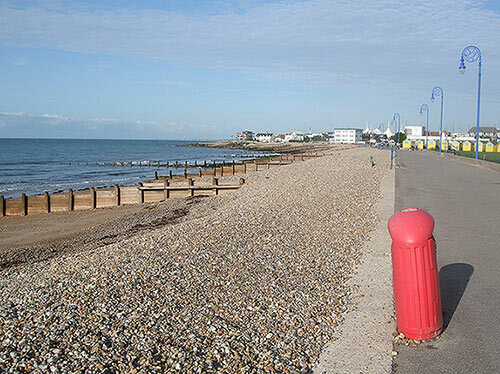 The start was 9.00 at Walberton Pond and I headed over there first along the seafront. This shot was taken looking back at Felpham. 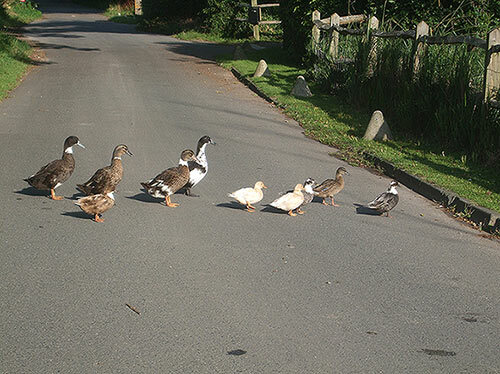 Then it was on to Flansham where some Ducks were in no hurry to move out of the way on Flansham Lane. At Walberton Pond there was just Sam and Mike to join me. 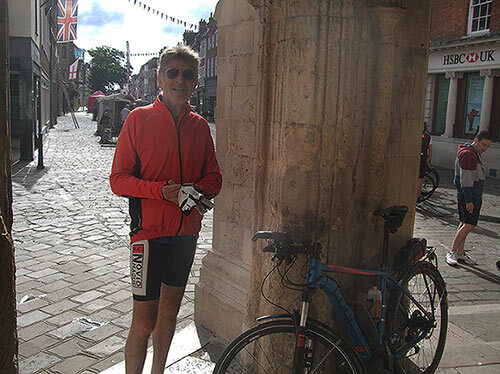 Colin was unable to lead and we agreed on a shorter ride to Midhurst to meet Arun Adur rather than the official Ride to Poynings. I took on the role of leader. We headed out via Madehurst, Houghton and Amberley. Then from Rackham it was a lane across to Greatham and a sign that the road was closed ahead. 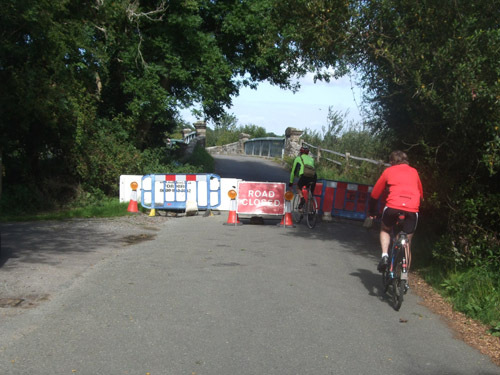 We decided to risk it and found that repairs were being done to the bridge over the Arun but luckily it was only closed for cars and a nice gap left for pedestrians and cyclists. 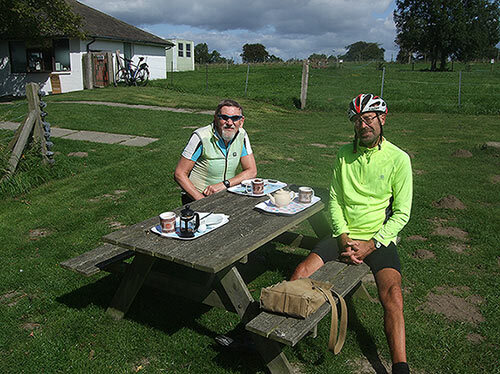 Then it was on via Coldwatham and lanes across to West Burton and on to Bignor Roman Villa for elevenses at the Cafe. 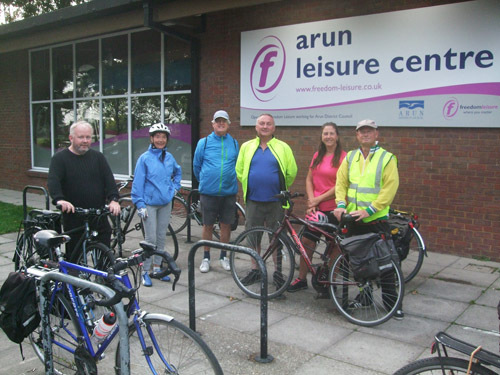 Arun Adur were also heading there for elevenses with Dave Fox leading. They arrived as we were about ready to leave so after a brief chat we headed on. We took a route via Sutton and Burton Mill Pond and then a lane across Duncton Common among the trees. Then it was on via Selham and past the polo fields at South Ambersham. Then another little lane to Midhurst and lunch at Gartons Cafe. Arun Adur arrived again not long before we were ready to leave after apparently taking in some rough tracks. With the clouds moving in we headed home fairly directly on lanes via Bepton and then the main road to Singleton and then the Centurion Way. Coincidently we came across Ernie and Nicola on the Centurion Way and rode back with them to Chichester. Mileage from and back to Walberton Pond if we had gone back that way would have been 50. My mileage from Pagham was 57. 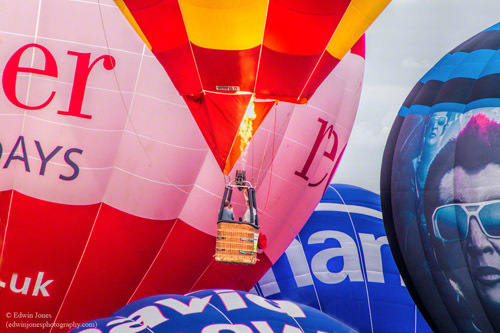 I was away last weekend visiting my sister in Bath and went to the Bristol International Balloon Fiesta. At the end of the day they had a mass ascent of nearly 100 hot air balloons and the following is one of many pictures taken. 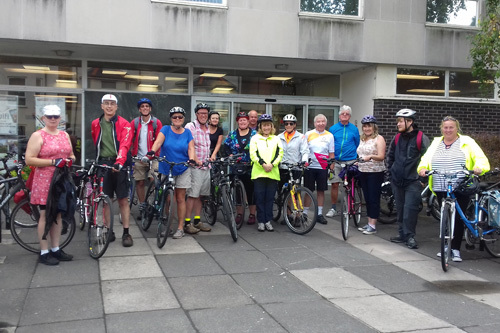 There’s always a good turnout for this ride and despite the unpromising dark clouds, today was no exception, with 16 setting out from Bognor library. 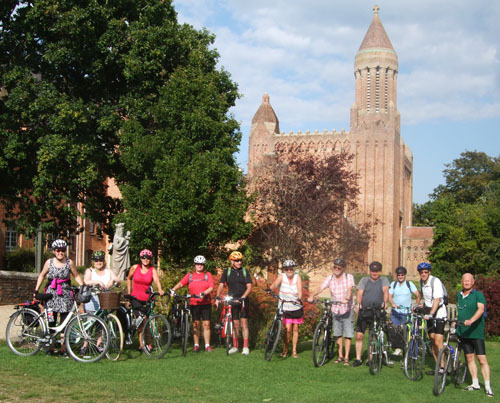 We welcomed more than a few newcomers...Carol, Jeanette, Carol, Mark, Frances, Mike, and Adam and Rebecca on a tandem. Plus Dave and Lucy, Clair, Chris, Alan, Maureen and Julian. Some unforecast rain had fallen in the morning but the sun was out by the time of the ride. However as we were about to set off dark clouds rolled in and rain threatened. I took the route via Felpham cricket pitch and the recently re opened route to Flansham via the golf club, and by the time we got there the sun was back out and it remained sunny with no rain for the rest of the afternoon. 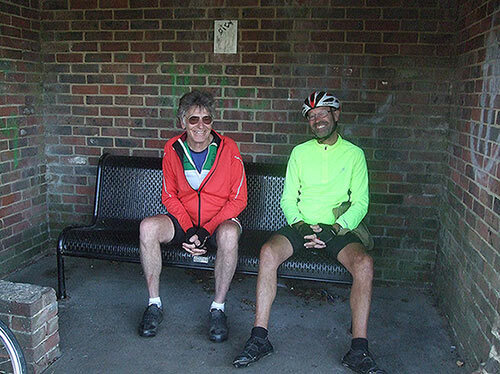 From Flansham we took the Barnham cycletrack and stopped near Barnham church for those with wet weather gear to dress down. 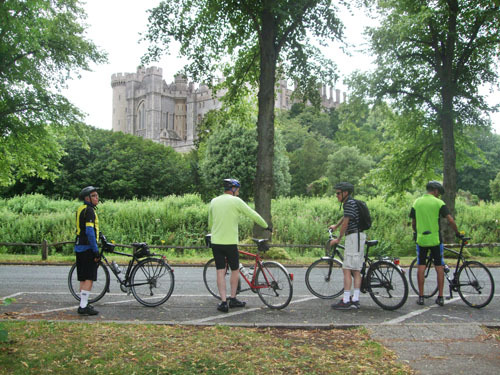 Then it was to Walberton on the new cycletrack, then Binsted and our route through the woods and the spooky Maddonna pond to arrive at Arundel the back way. The rough tracks new to many on the ride but we all got through without difficulty, including the tandem. The only casualty was me whilst changing too quickly through the gears - my chain dropped off the front derailleur. Arundel was busy with the Festival in full swing but our destination was the Putting Green Cafe which was much quieter. 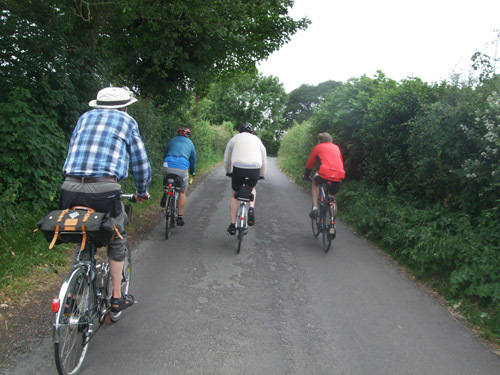 The return route via Ford, Yapton and Bilsham was quicker and flatter but busier. 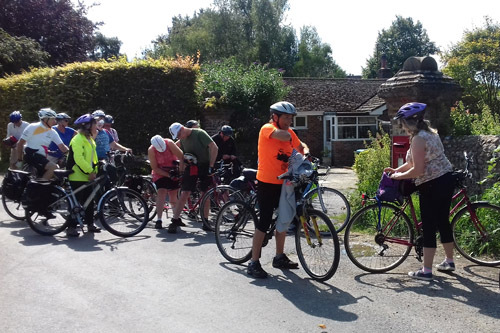 This was one of our longer Saturday rides at 23.0 miles round trip which i hope wont discourage our enthusiastic newcomers, who we hope to see out again. 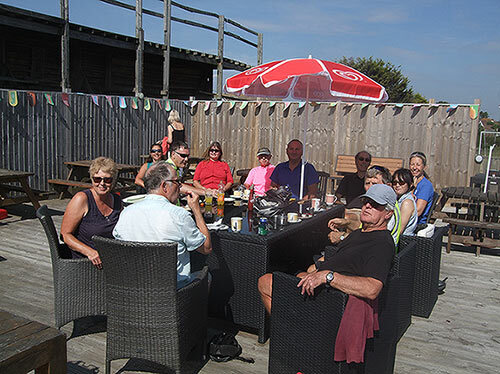 Today was the annual West Sussex CTC Group picnic held at West Wittering beach. 3 clubs headed down there from Bognor Chichester, Worthing area and Horsham and Crawley. In the end 20 met there as far away as possible from the crowds meeting near the Harbour entrance. 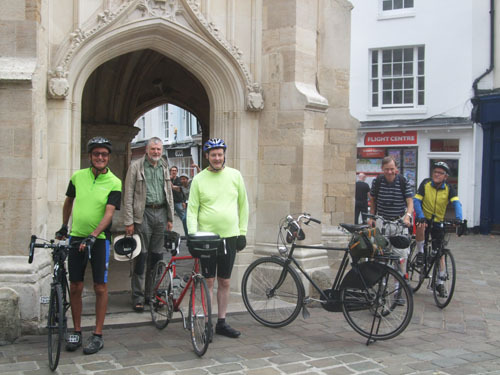 For Bognor Chichester Graeme was the leader and he was joined at Chichester Cross by myself, Bob, Terry, Graham Annaly and Andrew so 6 in all. We took a fairly direct route via West Street and then Apuldram lane to pick up the Salterns Way Cyclepath to Chichester Yacht Basin. We got to the Boat House Cafe just in time before the queue out the door started. Then we continued down the Salterns Way via lanes via Birdham and more paths down to Itchenor and more pathways and farm roads. 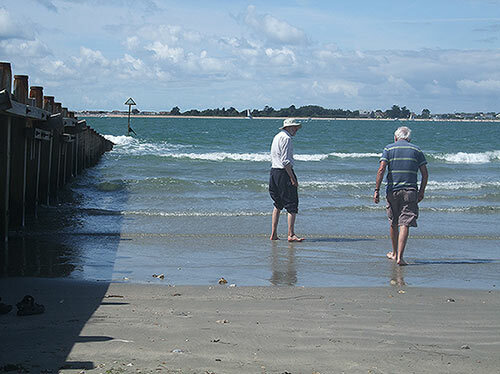 At West Wittering there was a brief stretch of main road before turning off. 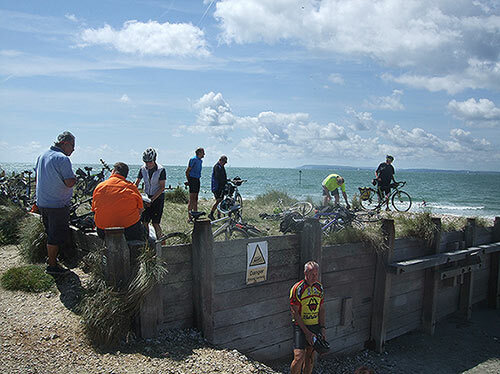 Then it was on to the road to West Wittering Car Park which was packed full of cars. We smugly bypassed the booth charging cars £8 for parking. We went on to the agreed meeting point at the far end by the large Red Flag visible from some distance. This area at the entrance to the harbour is banned to swimming so the beach there was near empty compared to everywhere else. We were first to arrive and got settled for our picnic. Bob and Graham took a brief paddle. Horsham Crawley were next to arrive with 9 and then Arun Adur with 5. A few from Horsham Crawley took to stone skipping. On the return ride Graeme led us and Arun Adur via East Wittering and Bracklesham Bay and then lanes via Earnley, Almodington and Sidlesham Common. Then it was a lane to pick up Route 88 across fields and a brief stop at a gate which seemed to be occasioned by a chat. Then it was back to Chichester via Fisher and Runcton. I peeled off at South Mundham to take lanes and tracks direct to Pagham. Mileage from and back to Chichester was about 25. My mileage from Pagham was 30. 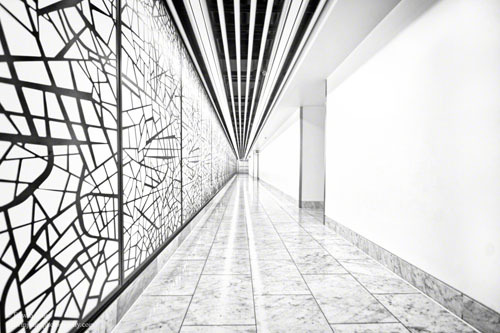 My latest picture to be processed was taken at a Canary Wharf shopping centre where they do pretty high quality corridors leading to their toilets. 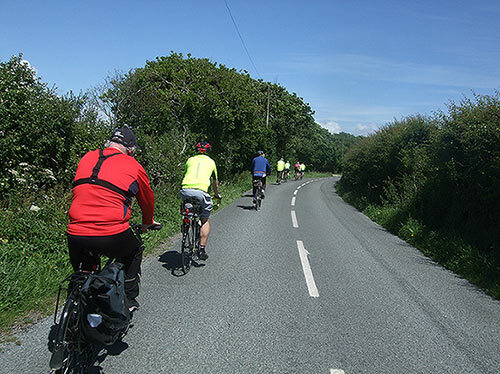 The weather for the ride today was pleasant, mainly sunny with some cloud and temperatures up to 19C though with a strong SW wind up to 20mph. 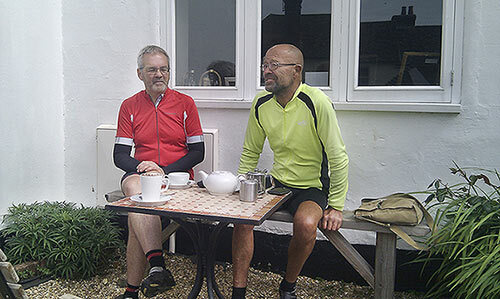 I was the leader for a ride which was due to go to Arlesford but as only Sam turned up we agreed on a shorter Ride to West Meon and a preview of the Ride Jeff will lead at the end of August to Cuppacheeno Cafe. We headed out on the usual lanes via Woodmancote and Rowlands Castle. 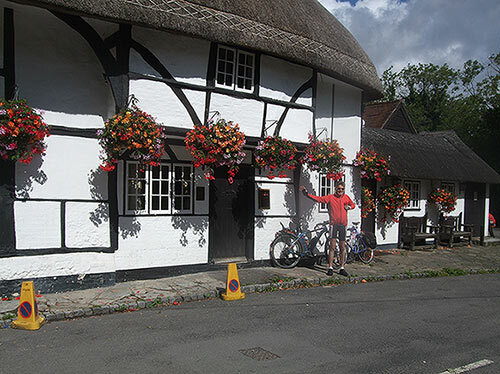 Then it was on to Chalton and a brief stop and Photo at the well flowered Red Lion Pub. 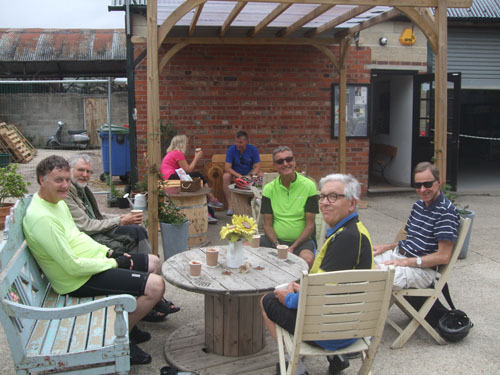 Then it was on to a stop for elevenses at Queen Elizabeth Country Park Cafe which seemed to be inundated with bikes as many others arrived at the same time. From there it was on via the opened last year cyclepath which takes a route well above the A3 towards Petersfield. We came out at the roundabout for the Buriton Road. 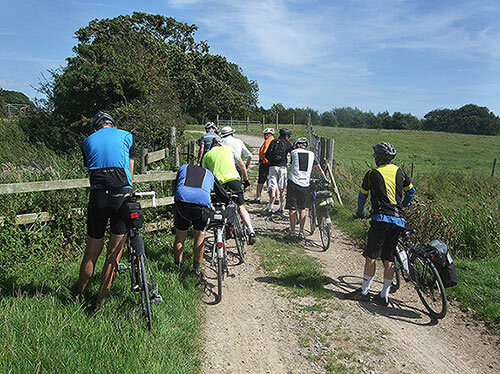 We turned off for the lane which leads to East Meon and Ramsdean. 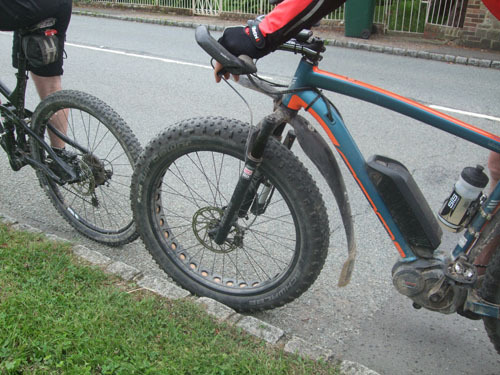 Here Sam had a mechanical as his electric motor died. A few resets and false starts resulted in the same problem. However the problem was soon found to be the magnet for the speedometer which is part of the control systems. Lacking any data as to what was happening the motor cut out. Turning the magnet into the correct position brought everything back online. Then it was on up the lane via East Meon which from the debris across the road had suffered from recent rains and we found more evidence of that near West Meon. From East Meon we followed the flat valley road to West Meon to stop for lunch. 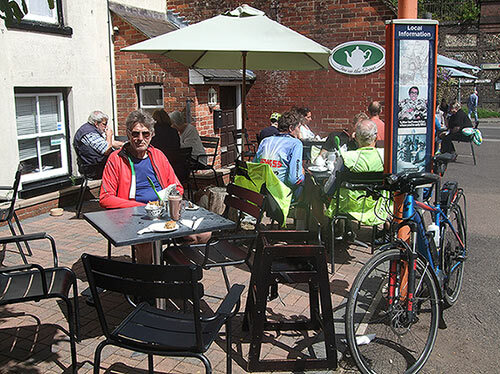 The cafe is at the back of the village shop with a suntrap terrace and serves snack lunches such as soup or sandwiches. We arrived soon after 12.00 which was just as well as it soon filled up. A girl at the next table volunteered to take our picture. The return took in a beautiful quiet lane via Meon Springs and up to the Ridge Road towards HMS mercury. During the 15 to 20 minutes we spent on this quiet road we didn’t see a car and had great views over rolling wheat fields. 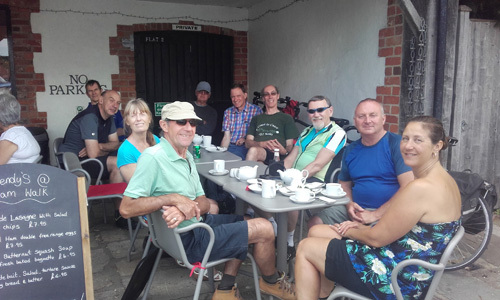 Then it was back via Clanfield and Chalton and a stop for tea at Rowlands Castle where we met up with a group of cyclists from Surrey including Chris Juden who used to work for the CTC and gave technical advice in Cycle Magazine. By our return our mileage from Chichester was about 52. My return mileage from Pagham was 67. My latest picture to be processed was one taken 11 years ago during a cycle tour in the American West. It is a shot taken as we rode down into Death Valley. It was about 100F at the time at 8.30am. An early 08.30hrs start for the long ride to Four Marks. Russell was leader and he was joined by Mike and Bob. With poor weather expected in the early afternoon it was agreed to ride to morning tea and then take a decision on the final destination. The group took Centurion Way to West Stoke and then on to Compton,encountering increasing numbers of Wiggle Sportive riders going in the opposite direction.Bob peeled off at Compton for tea and tiffin in the Village Cafe before completing his own ride, whilst Mike and myself pushed on for true elevenses at Cupacheeno, West Meon, arriving at 11.00hrs prompt. 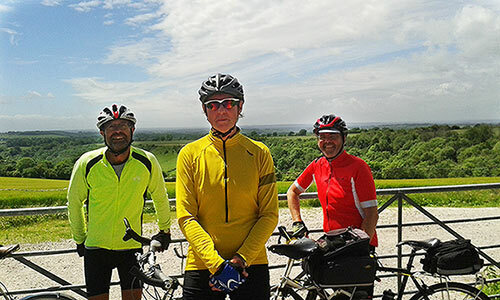 Ominous black clouds were gathering as we enjoyed our tea and flapjack, prompting a plan to abandon Four Marks as a destination and instead return to Chichester via Old Winchester Hill, Clanfield and Rowlands Castle. The first spots of rain started to fall during the climb up Old Winchester Hill, becoming steady light rain by the time we reached the top, prompting a pit stop to put on waterproofs. 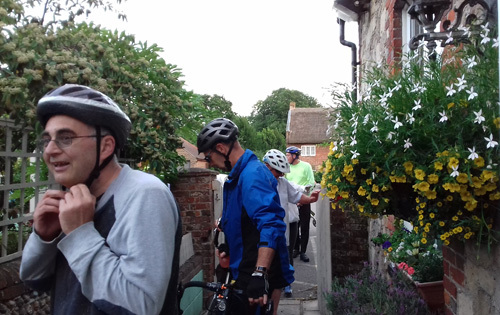 .Within 10 minutes the rain had turned to heavy, before becoming a downpour of biblical proportions as we descended into Clanfield, quickly flooding the roads and forcing an unscheduled alfresco lunch stop standing under the shelter of a village hall. 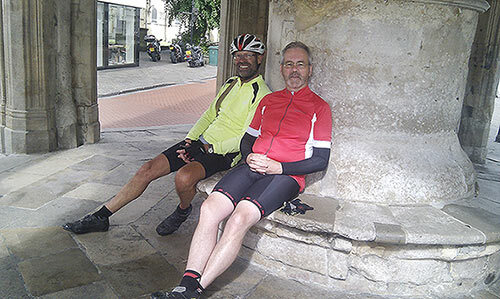 After 15 minutes or so the rain eased sufficiently for us to ride back to Chichester, noting the dry roads and increased warmth Westergate eastwards. Mileage for the shortened ride was 53 miles. 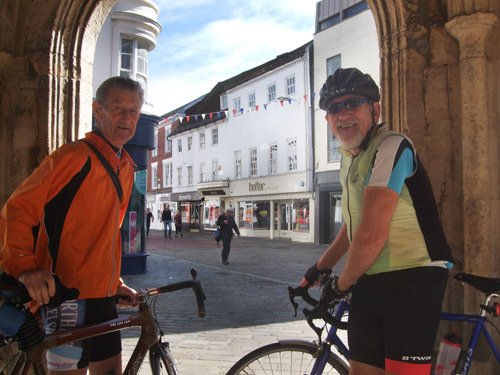 After failing to check the Rides List and arriving at Chichester Cross at 9.00 instead of the official 08.30, oops I was joined by Keith Dodman who only arrived because he was checking out if there was a short ride on. 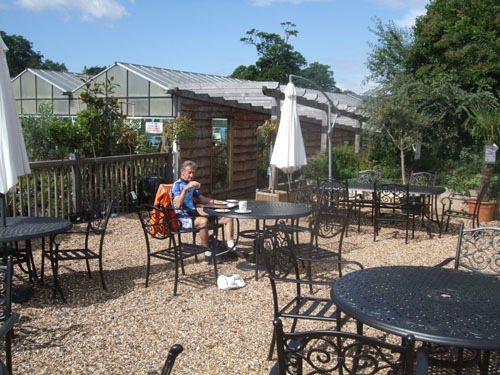 We decided on a half day ride to a first visit to Blossoms Cafe, Stansted. This is in the Garden Centre Shop area next to the usual Stansted Cafe. This destination proved just as well as from the weather radar anywhere over the Downs and especially to the NW received areas of rain from mid morning which did not reach the coast until mid afternoon. A lady sitting at the Cross offered to take our picture. We headed out via the somewhat overgrown Centurion Way and then on lanes via West Stoke and on via the usual Lane, Downs Road where we navigated a long area of road flooded from yesterdays downpours. Then on via Funtington and Racton and on to Stansted. Blossoms Cafe is reached by walking through the Garden Centre. There is a very large area inside with no queue and also a fair sized outside seating area. Very quiet and with prices cheaper than the main cafe. 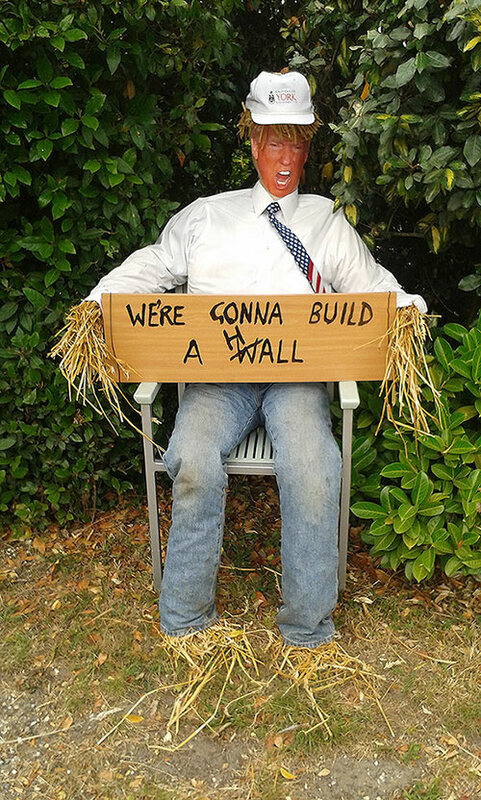 Worth a try perhaps for a Saturday Ride. We switched briefly to the usual (Pavilion Cafe) to chat to the group from Bognor CC but took a different route back. 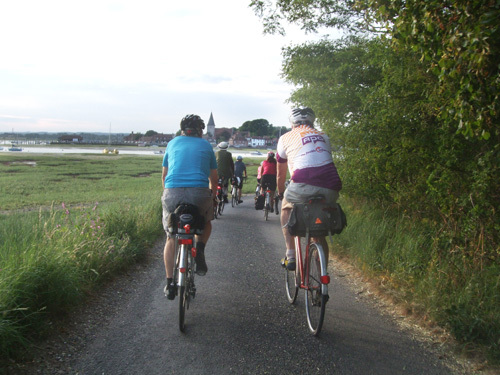 We headed back via Westbourne and Woodmancote and the usual South Coast Cycle Route lanes back to Chichester. Mileage from and back to Chichester was about 24. My mileage from and back to Pagham was 37. 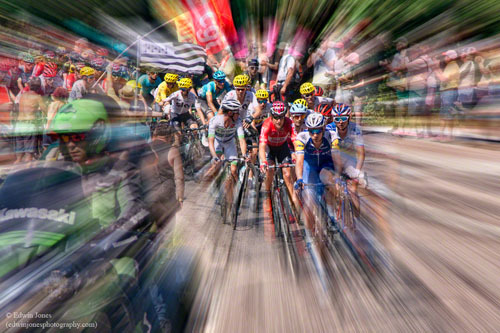 I have processed more of my pictures taken at the Tour de France. 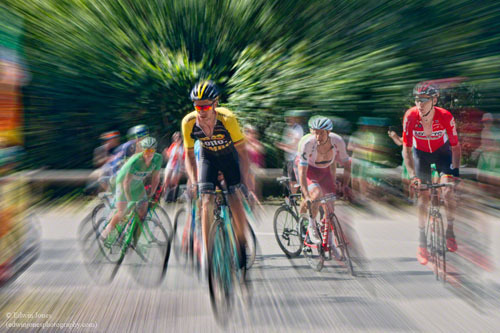 The first is from a corner on a small climb on Stage 6 on the 6th July finishing in Troyes with the Sky Team close to the front in Yellow Helmets. 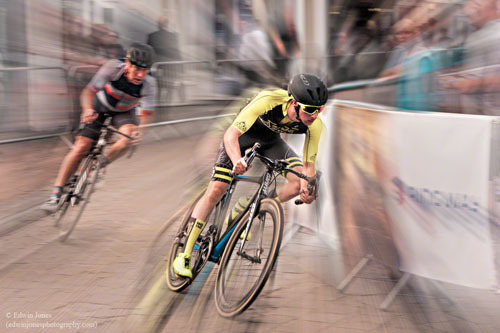 The second picture was taken the next day at the Start in Troyes with the racing neutralised until a few miles after the start and Chris Froome in the lead. A pleasant day today starting out cloudy but the sun coming out by the afternoon with temperatures up to 24C. 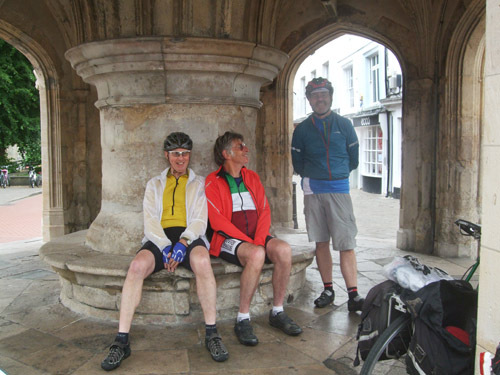 Harvey was the leader and he was joined at Chichester Cross by myself, Andrew, Terry, Bob and Trevor. Arthur and Lynn joined us at lunch so 8 out on the day. After a few backstreets we took the cycle bridge over the A27 and then down the cycle path alongside the A259 before turning off on lanes via Colworth and Woodhorn before taking the Oving straight to Eastergate. 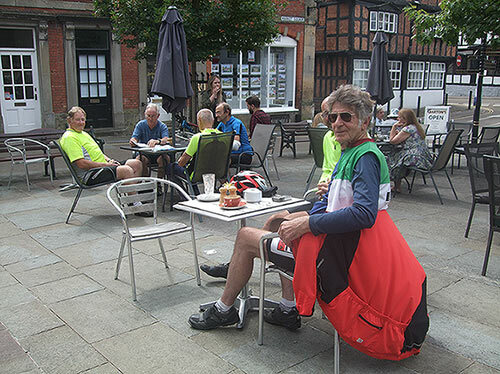 Then it was on via Walberton and Ford Lane to stop for elevenses at Edgcumbes Coffee shop. 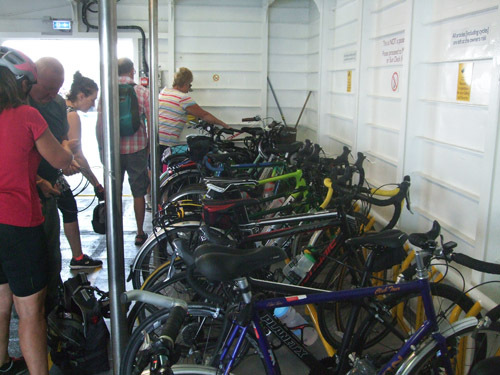 The limited space was soon taken by cyclists as another Club arrived. Then it was down the Ford Road and back streets to approach the town centre via the old bridge. Then on to lunch at the Putting Green Cafe where I found their substantial portion of Apple Pie was adequate for lunch. 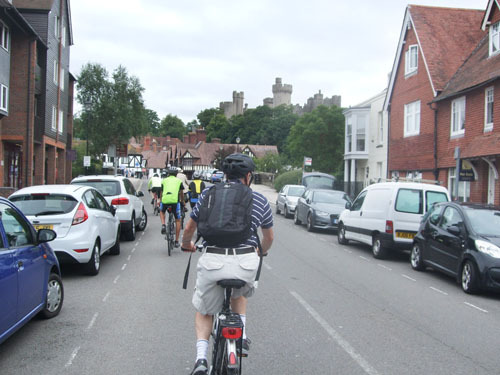 As we gathered on the road to depart we had a beautiful backdrop of Arundel Castle. 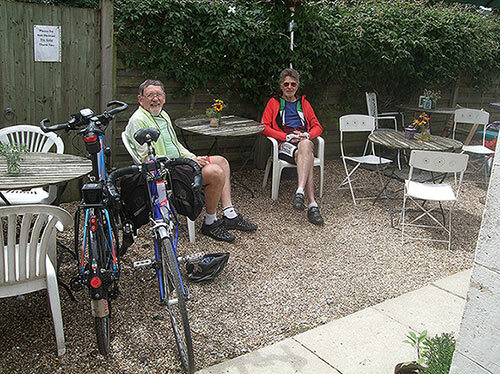 We returned on Ford Road and Ford Lane to Yapton and then stopped for tea at the Willow Tea Room Barnham. Mileage from and back to Chichester Cross would have been about 28. My mileage from and back to Pagham was about 40. 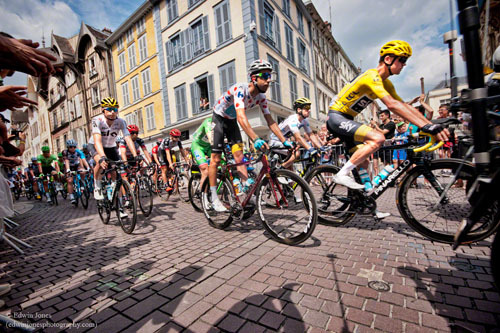 I have just returned from France which included viewing 3 stages of the Tour de France. Probably the best stage was Wednesday 5th July when we viewed the first mountains finish climb into the Vosges. We were located at the first major hairpin after a very steep climb which had split the peloton into many smaller groups. 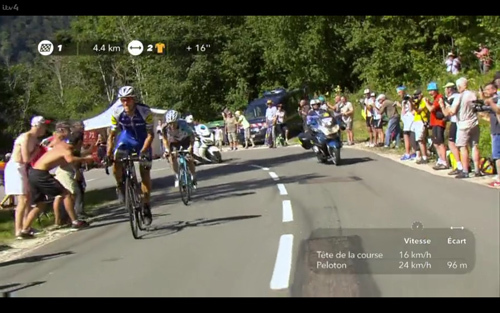 The shot below is a screenshot from the ITV catch-up service. Richard Boulton is most obvious in the bright red shirt and blue cap on the right. I am just visible next to him on the right followed by Peter Wilson. Next is one of the shots I took of a group climbing round the hairpin. I led this ride for John. 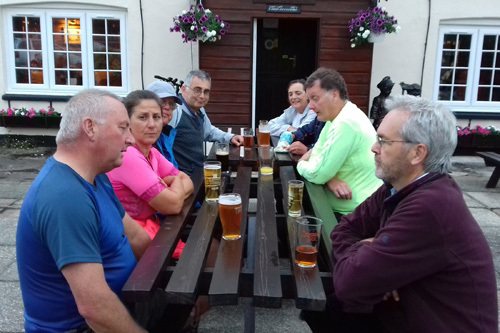 6 were at the ALC start point- Steve, Carol, Keith, Maureen and Tony- with a further three (Harvey, Julian and Russ) meeting us at the pub after coming direct. The sky was clear with no wind to speak of so taking advantage of these excellent riding conditions I took the riders along the seafront to Middleton. 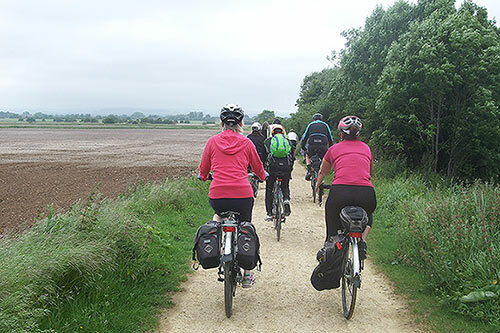 We then headed inland through Elmer to Ancton and then via Ancton Lane to Comet Corner and Bilsham. At Yapton we took the Climping road then turned at Rollaston Park to cross Ford airfield to the industrial estate. Emerging near the prison it was a short sprint along an unusually quiet lane to the Ship and Anchor. 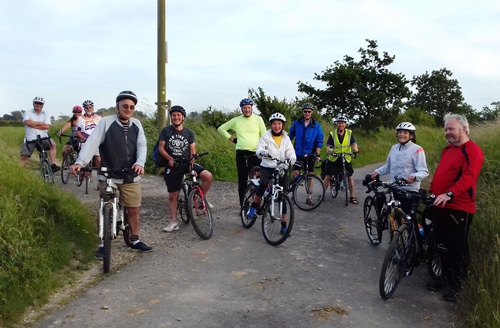 The return route was via Ford Lane, Yapton canal bridge and back to Felpham via Middleton. After a cloudy start the sun came out in the afternoon with temperatures up to 21C though with a brisk west wind which somehow managed to be a headwind both going out and coming back. At the start there was just myself, Russell, Jeff and Sam with Sam being the leader. 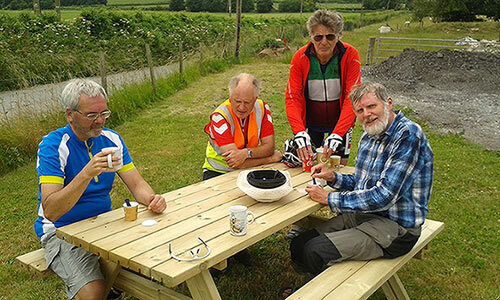 I returned home after elevenses for a half day ride while Bob was late and caught us at West Stoke and Chris joined at lunchtime so there were 6 out during the day. 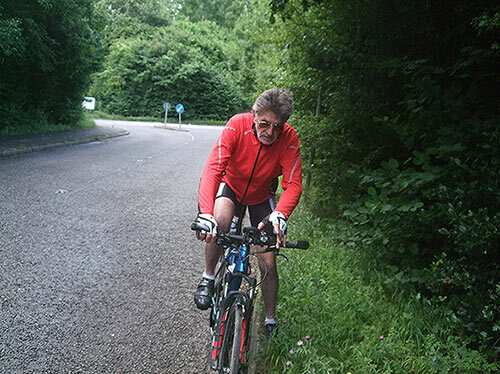 Sam led us out via the Centurion Way and West Stoke where Bob caught us we continued on some very quiet lanes. Then it was on via Funtington. 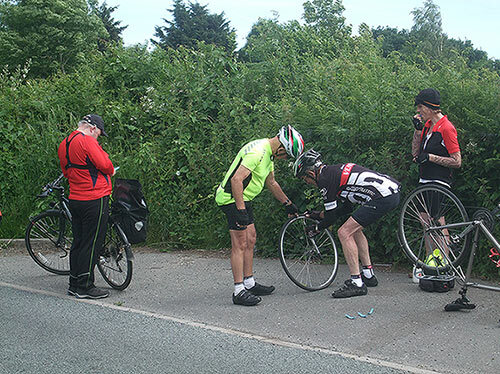 Then it was up the B Road via West Marden to stop for elevenses at Compton Cafe arriving soon after 10.00. 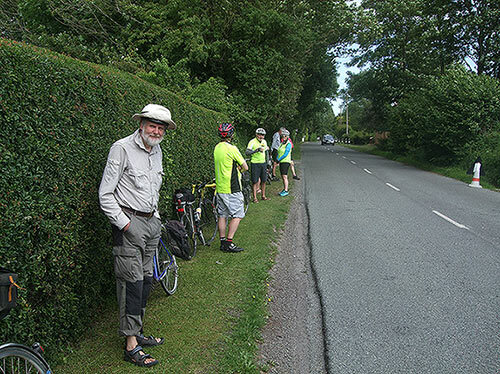 Graham Young coming from the other direction after riding 47 miles joined us there for elevenses. 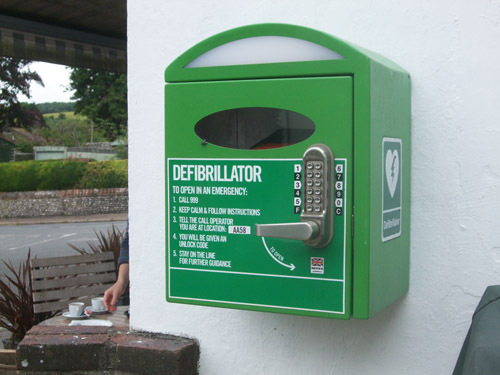 It was reassuring to note that with all the cyclist customers having overdone the exercise or the cake there was a defibrillator ready to assist. I returned home by 1.00 and completed 35 miles. Jeff reports on the rest of the main ride. 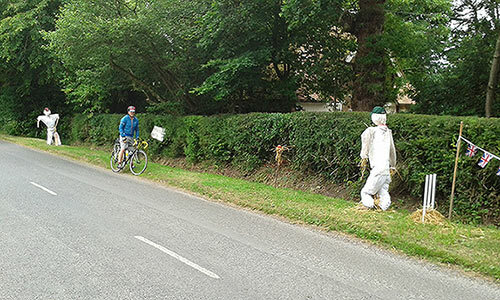 We headed due north to South Harting and Nyewood where it was last day of scarecrow fest. Then it was on to the A 272 to the Hamilton Arms, Stedham. Chris joined for lunch and tucked into the £10 Thai or English roast . Must try next time. We headed back via Ingrams Green, Didling and at top of Cocking hill went up SDW to Farm shop tea room .Very basic but great view, see picture. Then we used the Centurion Way from West Dean all the way back . After the end of the heat wave it was less oppressively hot but still pleasantly warm on the longest but one day of the year. Graeme Hodge was the leader and 8 of us in all met for the start at Chichester Cross. 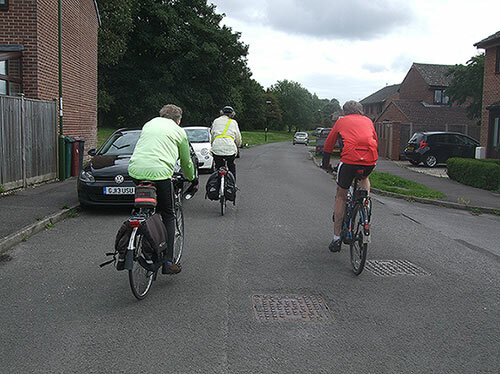 We headed off down West Street with a diversion to avoid the footbridge which is not very tandem friendly. Then it was up Clay Lane. 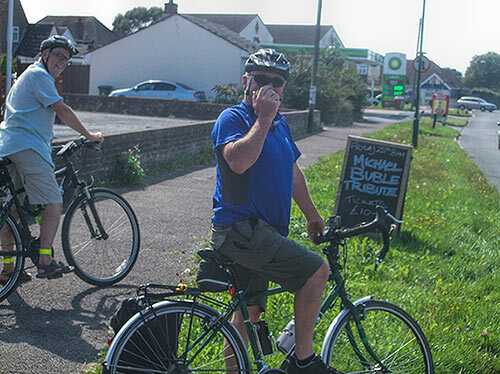 Then it was down Blackboy lane to the A259 which we swiftly left onto the pleasant lanes leading to Bosham Hoe and then round Bosham Harbour. 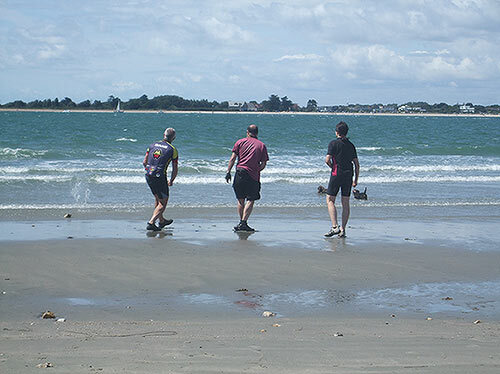 After negotiating some seaweed on the road left by the tide we headed inland via Bosham Lane and back to the A259 which we soon left to take the cyclepath alongside. Some ducking was needed to avoid branches growing above. A little confusion was evident in the group as we sailed past our destination Pub. This was to ensure a longer ride by taking the lane round Chidham. Then it was back to the main road and on to the Bosham Inn which is fairly large with a good garden. The return was direct down the main road where we found that drafting behind a Tandem much increased our speed capabilities. Back in Chichester we split up to make our ways home. Twelve at the Arun Leisure Centre start point on a lovely cloudless summer evening but with a brisk south westerly wind making it hard work cycling westwards, which was exactly the way we were heading. 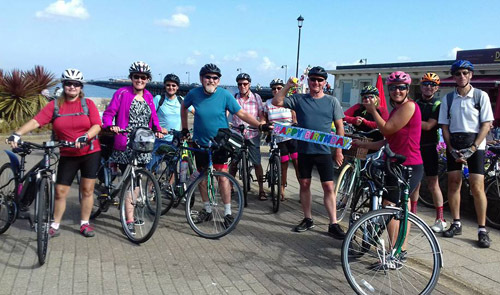 I led Carol, Steve, Mike, John, Andy, Maureen, Keith, David, Jo, Harvey and Dave through Bognor and onto the prom. 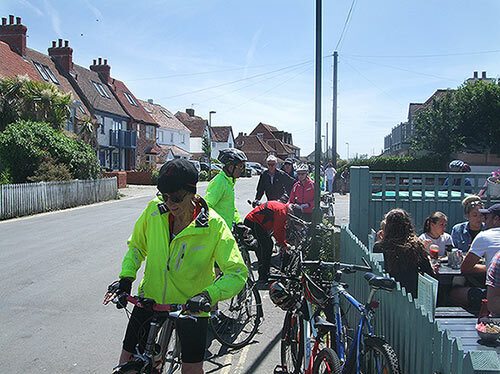 At West Park we rode to Pagham via Fish Lane, Barrack Lane and Stoney Stile Lane. We then took the rural route via Summer Lane. 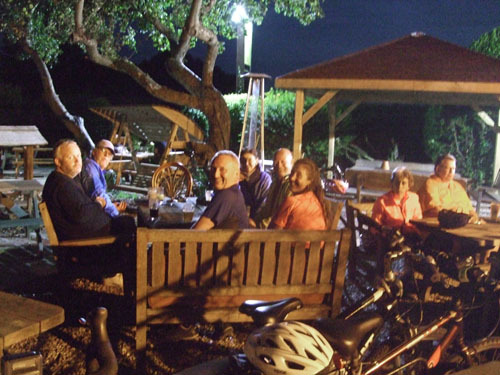 Then it was South Runcton and Fisher arriving at the Anchor pub Sidlesham after passing through Chalder Farm. For the return route Steve Carol John and Harvey decided to go back by road by way of Hunston and Lagness. The rest of us took the more picturesque but slower route across the fields and around Pagham harbour. This was accomplished without incident and mostly in daylight. It was not fully dark till well after 10pm. Around the harbour we took a short detour to check if a route avoiding an unfriendly gate was available but unfortunately a secure fence was in place and we had to double back on ourselves for a couple of hundred yards. However the unfriendly gate proved not much of an obstacle after all and we continued unimpeded around the harbour wall. From Pagham a trip through the Craigweil estate brought us to Aldwick from where it was straight back along the prom to Felpham. By this time the wind had dropped considerably so a pleasant end to the evening. Round trip mileage from and back to the Arun Leisure Centre was 17.5. After a cloudy start it was a beautiful sunny day with temperatures up to 19C though with a brisk SW wind. At the start there was just myself, Mike and Russell with Russell being the leader. 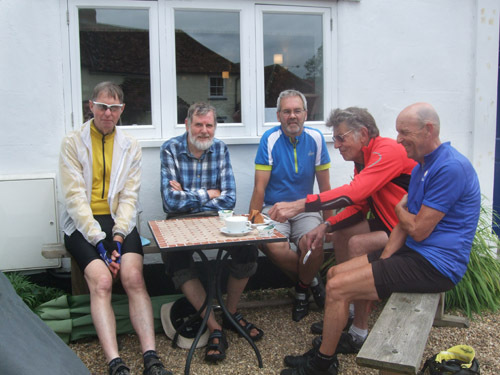 I returned home after elevenses for a half day ride while Jeff joined soon after elevenses at Idsworth and Chris joined at lunchtime so there were 5 out during the day. Russell led us out via the Centurion Way, West Stoke and Funtington. 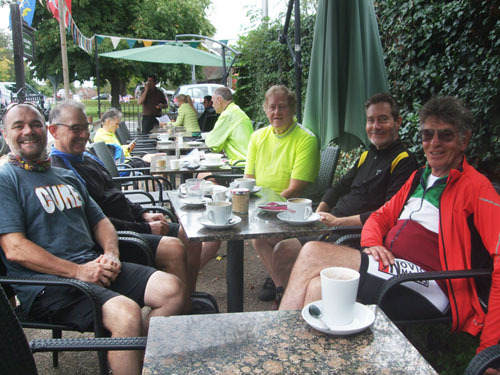 Then it was up the B Road via West Marden to stop for elevenses at Compton Cafe arriving soon after 10.00 to beet the usual groups from cycling Clubs having the same destination. 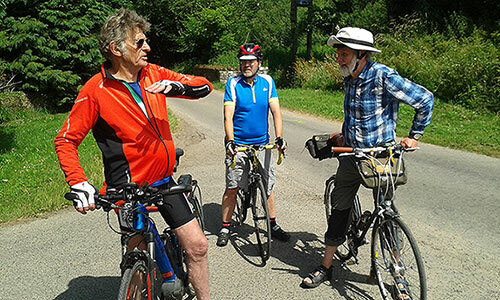 When I turned for home the rest continued via the back road to Idsworth where they met up with Jeff. Then it was on via Buriton and East Meon and West Meon. 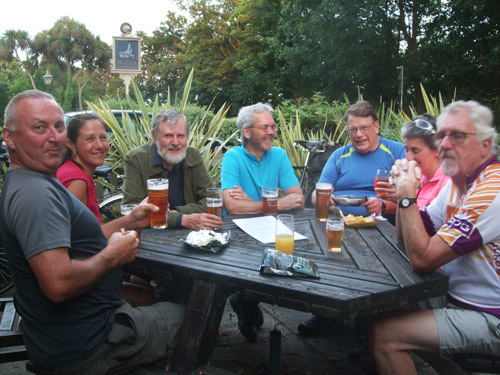 Then a route was taken on paths including part of the South Downs Way where a passing walker kindly took this picture of the group with Jeffs camera. Then it was on to Exton and a picnic lunch at the Church. The return was via Rowlands Castle. Thanks to Mike and Jeff for the pictures. 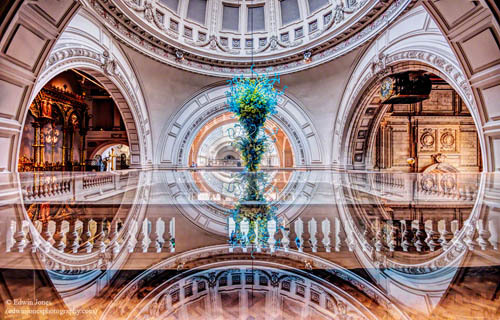 My latest picture to be processed was the central hall of the Victoria and Albert Museum with a reflection in the top of a Display Case. 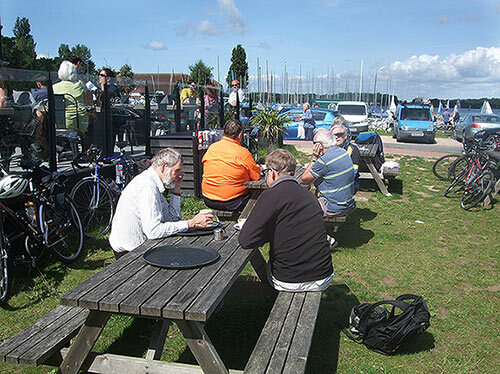 The weather dawned sunny and breezy for a ride to Bosham Arcade Café. 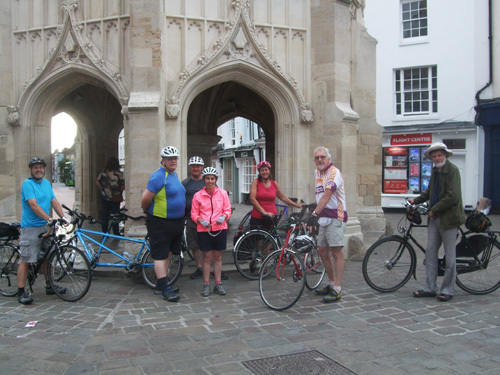 Eleven cyclists gathered at Chichester Library – Philippa, Edwin, Steve & Carol, Dawn & Fred, Chris, Andy, Kev, Roy and Julian. 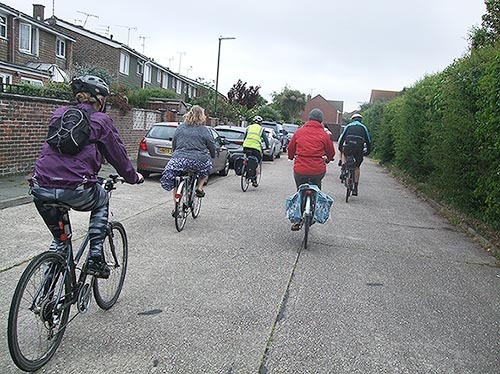 The group headed west towards Westgate, over the Fishbourne crossing and then carried on until the end of the road, before heading through the A27 underpass towards the A259. 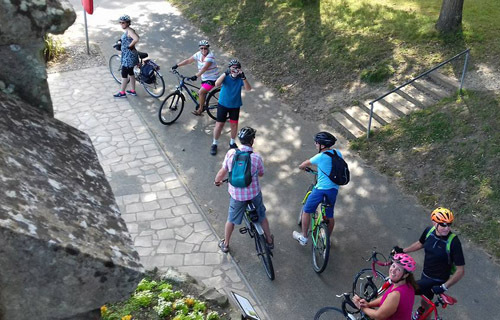 After emerging from the underpass, everyone then took a sharp right to take the cycle path past Fishbourne Roman Palace, which then lead onto Salthill Road. 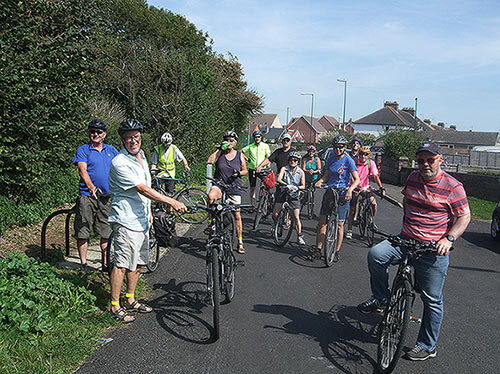 The group then headed left and then right, to take the newly maintained cycle path through to the A259. Heading west through Fishbourne, everyone turned left to go down Old Park Lane. We then headed into the village for refreshments at the Arcade Cafe. 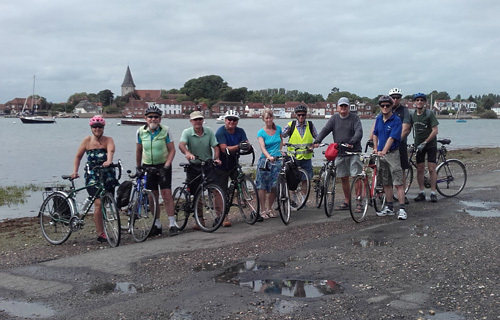 From here, everyone headed north through the east side of Bosham, picking up the marked cycle route and coming out onto the A259. From there, it was a short ride back to Chichester, arriving at approximately 4.45 pm. 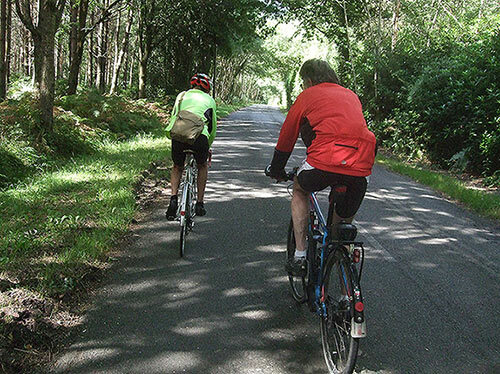 The weather for the ride today was pleasant being dry with a lot of sun and temperatures up to 17C though with a strong SW wind. 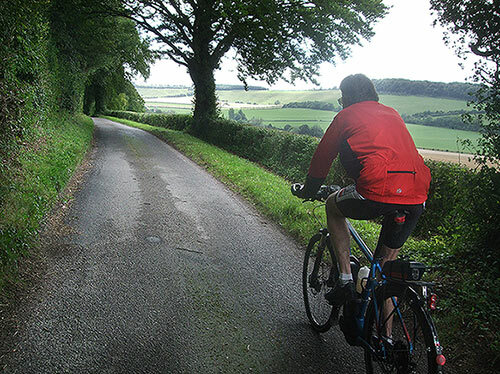 This was Arthur’s flat 100 mile ride so the route was carefully devised to keep to the coastal plain avoiding all hills, while taking in a lot of quite lanes. Breakfast would normally on this ride be at the Boaters Bar, Prinsted but as that burned down a few months ago the destination was changed to McDonalds, Havant which has the advantages of opening early and giving fast service. 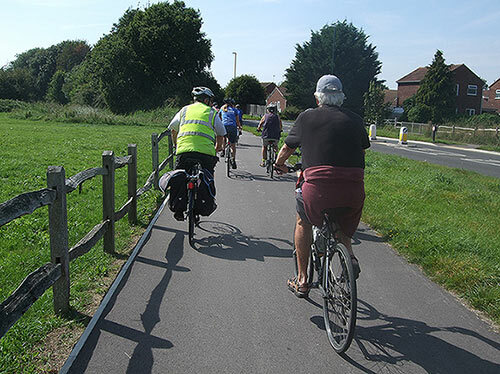 The route to lunch included some of the Salterns Way cyclepath. Having ridden a hundred miles many times before and still getting fitness back after an accident in April I decided to join the group for lunch and ride part of the afternoon section. I went to East Wittering via South Mundham and Fisher. At East Wittering lunch was taken at the Boulevard Café which gave prompt service of the usual large portions. We then gathered outside for departure. Then it was lanes up via Earnley and Almondington. 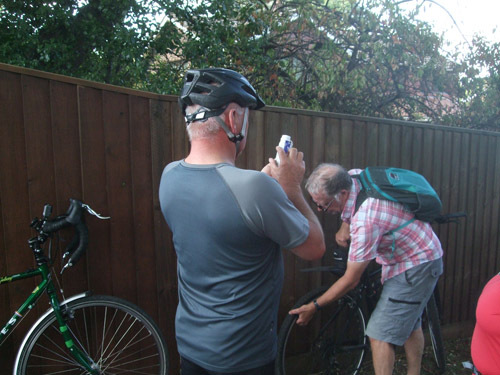 Then on via Sidlesham and Hunston and after a loop down to South Mundham it was back via Merston and on via the cyclepath alongside the A259 towards Bognor before turning onto the Colworth lane and on to Westergate to turn off on the lane towards Walderton and a rest while Arthur and Martin fixed Lynn’s puncture. The select few did the mending. While the rest waited and chatted and watched. We turned off just before Walberton to join the cyclepath to Barnham. 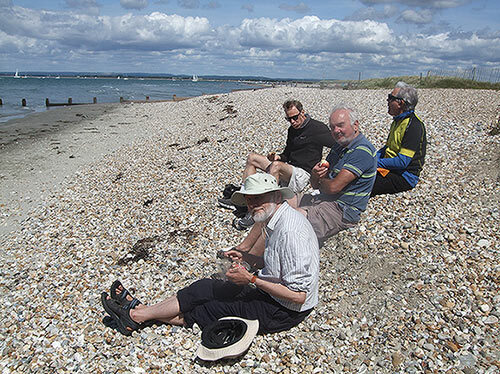 I left the group at Barnham to take the Barnham path home to the coast. 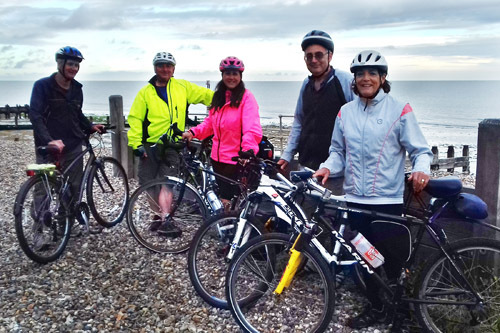 The rest continued aiming for tea at the Look and Sea Littlehampton before returning to Chichester to complete the 100 miles. My mileage in all for the day was 41. 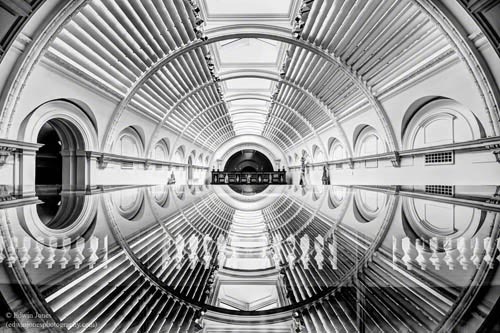 My latest picture was taken in London on Friday at the Victoria and Albert Museum. 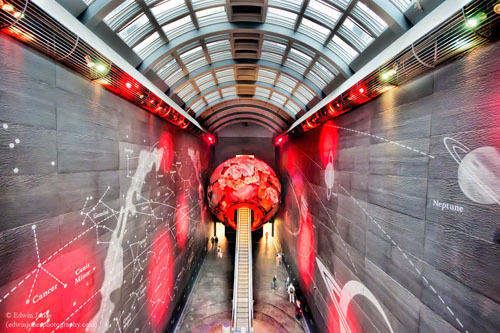 It shows the roof of one of the Galleries taken from a walkway above it with the roof reflected in the glass of the top of a display case. 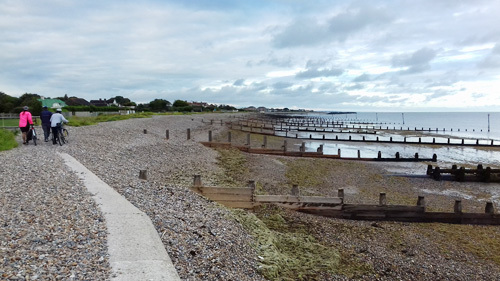 The weather today was cooler with more cloud than of late though it stayed dry (Cycle Bognor No Rain Guarantee, conditions apply). 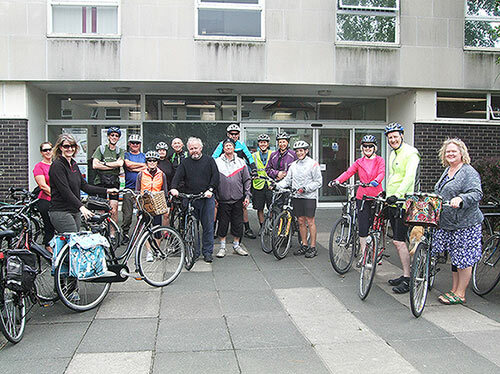 David Sinclair was the leader and in all 17 of us met at Bognor Library for the start of the Ride. 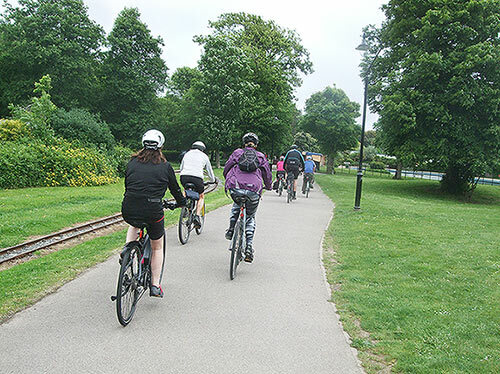 David led us out on a different route from the usual riding on the cyclepath through Hotham Park. Then it was on up the cyclepath alongside the A259 before turning off on a mix of backroads plus a path lined with nettles (ouch) to reach the cyclepath alongside the new bypass to Flansham. 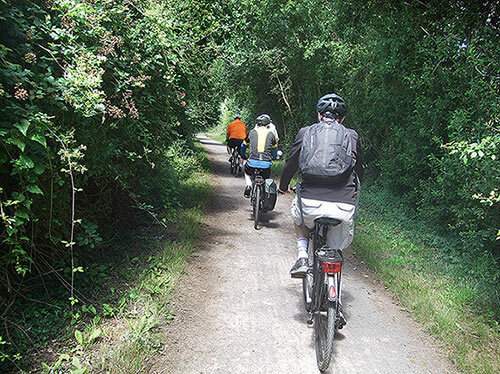 Then it was up the cyclepath linking across the fields to Barnham. Some puddles on the route evidenced the thunderstorms of the previous night. 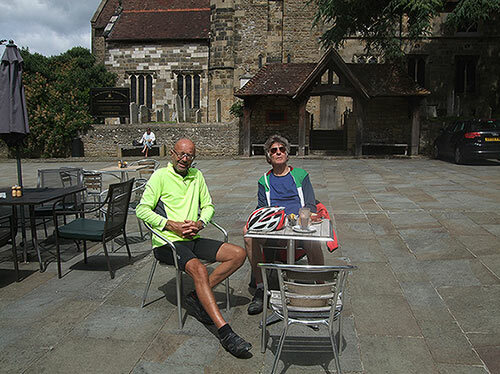 We took the lane past the Church to Barnham and then on via Yapton and Horsemere Green Lane and onto the cyclepath at Climping alongside the A259 where we stopped for a rest while Kevin mended a puncture. Then it was a backroad to the footbridge over the Arun and into Littlehampton. 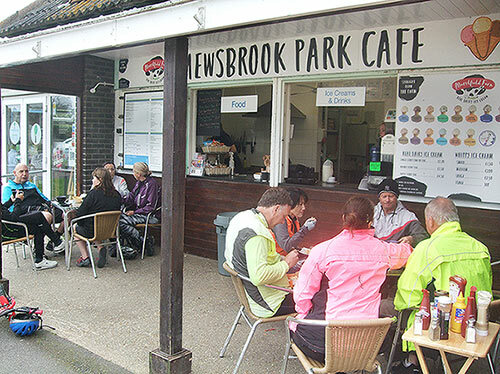 We continued along the seafront road to stop for tea at a new Cafe for us of the Mewsbrook Park Cafe. David then took over to take us back over the footbridge and a much more direct route back via the main road. We split into smaller groups so the cars could get by easier. Then it was backstreets via Middleton and Felpham. Mileage from and back to the Library was about 21.